ABC ratings: A 'Lost' cause? The Disney-owned network had a tough February due to a ratings slip for 'Lost,' and competition from Fox's 'American Idol' and the Super Bowl on CBS. NEW YORK (CNNMoney.com) -- What a difference a few months made for ABC. The Walt Disney (Charts)-owned television network was riding high earlier this season, winning the November sweeps period with the crucial 18-49 year-old demographic that advertisers covet. 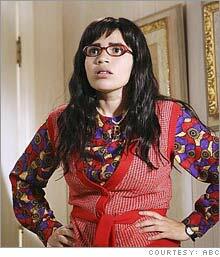 "Ugly Betty" has been a freshman hit for ABC but media buyers say that ABC needs more new shows to do well next season. Ratings with a key demographic are down sharply at ABC this season. But February was a challenging month for ABC. The network faced tough competition from CBS (Charts), which aired the Super Bowl earlier in the month, and Fox, which is benefiting from the return of "American Idol." Making matters worse for ABC, ratings for one of its key hits, "Lost," have declined sharply since the show returned to the schedule earlier in the month after a long break and in a different time slot. Ratings for "Desperate Housewives," are also down from this time a year ago. And ABC, which launched the most new shows this season of any network, has only had two true new hits with "Ugly Betty" and "Brothers and Sisters." Add all that up and you have ABC finishing a disappointing third with both 18-49 year-olds and overall viewers during the key February sweeps period, according to preliminary figures from Nielsen Media Research. ABC, which broadcast the Super Bowl in 2006, won the February sweeps period last year among 18-49 year olds. "Ultimately, with some of ABC's programs starting to show their age, that's going to be an issue with advertisers. I would be concerned about 'Lost,'" said Bill Carroll, vice president and director of programming with Katz Television Group, a consulting and media buying firm in New York. News Corp (Charts).-owned Fox, thanks largely to "American Idol" and the 33 million viewers that it averages for each of its two normally scheduled weekly shows, finished in first with the advertiser-friendly demographic and second overall. (Fox aired 'Idol' three times a week several times in February.) CBS finished second with 18-49 year-olds but led total viewers. NBC, owned by General Electric (Charts), remains in fourth place overall and with 18-49 year olds, despite having one of the biggest new hits this year with "Heroes." John Rash, senior vice president and director of media negotiations with Campbell Mithun, a Minneapolis-based media buying firm owned by Interpublic Group (Charts), said ABC's ratings slump last month shouldn't come as a huge surprise considering the buzz being generated by "American Idol." Still, he thinks ABC may have gotten hurt more than other networks because of the decision to put "Lost" on the shelf from early November through early February, and to also shift the time slot from 9 pm to 10 pm ET on Wednesdays. "ABC's challenges are shared by every network but Fox because the cultural sensation of 'American Idol' is stronger than ever. But part of ABC's wounds were self-inflicted by its scheduling strategy with 'Lost,'" Rash said. ABC's slip in the ratings could be a cause for concern heading into the so-called upfronts in May, the time when networks woo advertisers with clips of new shows for next season at elaborate events held in New York. The upfronts kick off the period of negotiations between networks and marketers to sell commercial time for the following season. Last year, ABC was able to command about a 3 percent to 4 percent increase in ad rates and took in approximately $2.3 billion in prime-time advertising commitments, according to comments made by Anne Sweeney, co-chairman of Media Networks and president of Disney-ABC Television Group, at an investor conference last fall. This year, could be tougher, some media buyers said. ABC's ratings renaissance appears to be running out of steam, even though the key show "Grey's Anatomy," which ABC moved to Thursday nights to take on CBS' stalwart ratings juggernaut "CSI," has seen its ratings improve this year. To that end, there have been reports that ABC is planning a "Grey's" spinoff for this fall. "ABC has been having trouble finding new programs. They can't just rely on returning shows. There should be some concern over at ABC," said Jordan Breslow, director of broadcast research with MediaCom, a media buying firm owned by ad agency WPP Group (Charts). Through the first 23 weeks of this television season, ABC is in third place with 18-49 year-olds, trailing first place CBS and Fox slightly. NBC is in fourth. But ABC is likely to get a much needed ratings boost later this month when the network's hit reality show, "Dancing with the Stars," returns. The two weekly episodes of that show, which aired earlier this fall, currently rank as the third-most watched and sixth-most watched programs on prime-time television. "We have to see how the remainder of the season goes. That will be a more critical factor than just February's performance," said Katz' Carroll. Shari Anne Brill, vice president of programming with Carat USA, agrees, adding that ABC could wind up finishing the season in second place with the most sought after demographic. Brill said it will be an interesting battle to see who winds up in second, third and fourth, but that first place is probably wrapped up: Fox should eventually surpass CBS and win the ratings battle for 18-49 year-olds for the third straight season. Fox also appears to have another hit on its hands with "Are You Smarter Than a 5th Grader?" a game show that debuted this week after "American Idol" with very strong ratings. "Idol" has often helped boost ratings for other Fox shows, including "House," which is currently the tenth most-watched show on TV. "The impact of 'American Idol' will continue to be a force for the rest of the season. There is only one Super Bowl," Brill said.